Paclitaxel is an effective therapy for patients with solid tumors. While the albumin-bound formulation eliminates the hypersensitivity reaction caused by the Cremaphor solvent, significant peripheral neuropathy persists when given over the standard 30-min infusion time. We sought to determine if the incidence and severity of peripheral neuropathy could be reduced when the infusion time is lengthened to 2-h. 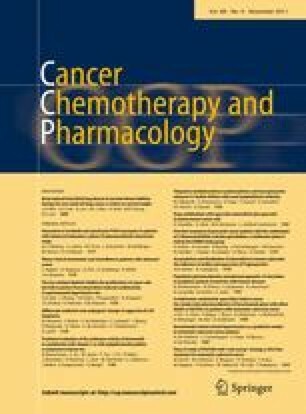 This was an open-label, single-arm, phase 2 study of albumin-bound paclitaxel given over 2 h. Twenty-five patients with advanced non-small-cell lung cancer were enrolled to determine whether the longer infusion reduced the severity of neuropathy compared to data from an earlier cohort of 40 similar patients treated over 30 min Patients received 125 mg/m2 of albumin-bound paclitaxel IV over 2 h without premedication on days 1, 8, and 15 of a 28-day cycle. Radiologic assessment was performed every 8 weeks. There was a significant 0.45 grade decrease in average peripheral neuropathy experienced by patients in the 2-h group versus the 30-min group (90% CI, 0.03-0.87). There was, in addition, a significant decrease in grade ≥2 peripheral neuropathy in patients treated over 2 h versus 30 min (28% vs. 55%, 2-sided P = 0.04). A decrease in grade ≥2 neutropenia (20% vs. 48%, 2-sided P = 0.07) was also observed. The median survival, 11 months, was the same for both groups. Increasing the infusion time of albumin-bound paclitaxel from 30 min to 2 h resulted in a significant reduction in both average and grade ≥2 peripheral neuropathy without affecting survival. Grant support is given by Abraxis BioScience, Los Angeles, CA.